I have a 1997 Lexus ES300. Twice now, when I parked somewhere to get something, when I came back and started up the car, it started to stall out. The RPM's would start at around 1,000 and then go down to zero and shut off the car. After letting the car sit for 10 or 15 minutes I started to car and everything was fine. No idling problem. What could be happening ? If you hit the gas, can you prevent it from stalling? Yes, if I hit the gas it will not stall. But once I let my foot off the gas the RPM's go to 0 and the car shuts of. I did have one of the guys at work hook up the computer a few months ago and it read that one of the knock sensors has problems. But I was not having the problem of the RPM's going from over 1,000 down to 0 at that time. And this problem does not happen every day. When I get out of my car at work and leave the car to sit all day, I have not had the idle problem when leaving work. I will try to have the guy at work run the computer check again tonight after work. There might be a problem with the rotary idle air valve. The rotor portion gets carboned up and sticks. It is a fairly common problem on those if they have a lot of mileage and age. Its not too difficult to repair. You have to remove the throttle body and the idle air control valve assembly from the throttle body. You'll need the idle air control gasket, tooth brush, carb cleaner, and an impact driver with Phillip bit installed to remove the screws. 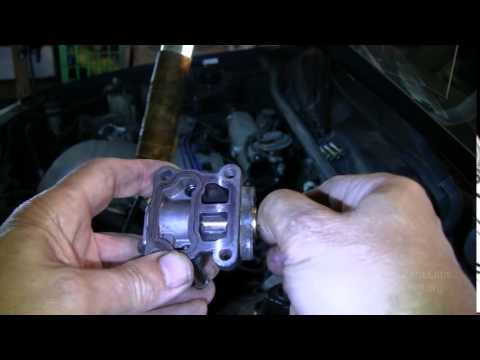 Once you get it apart, remove the electrical coil from the idle control valve, so you can rotate the valve shaft. Use carb cleaner and a tooth brush to clean the rotary portion, so it rotates freely. Put it all back together and see how it goes.